1942 Halvorsen Cruiser. Purchased in Sydney, trucked to Hobart and spent 2.5 years out of the water, undercover rebuilding. Cabin sides and windscreen had been damaged by rot. Double diagonal oregan planking on the hull which when stripped back was in excellent condition. Shipwright replaced cabin sides and built new timber windscreen. All glass replaced and shape of windows modified to match the cabin shape. All structural work done by a shipwright and I sanded, painted and reworked the interior. 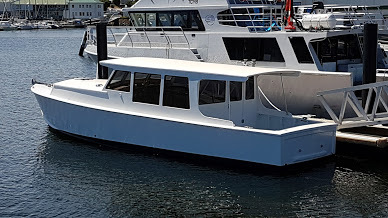 Set up for 2 people to cruise the D'Entrecasteaux Channel and further afield as my cruising experience grows. New gas cooker and waeco refrigeration installed, all new wiring, plumbing, fuel tank, stainless drive shafts and electronics installed. Has full height stand up shower. Cruises nicely at 7-8 knots at 1800 revs with a top speed of 10 knots. Have had half a dozen 3-4 day cruises since relaunching in December 2016.